Dental crowns are made of various materials that fall into three broad categories: Porcelain-fused to Metal- the crown with the wider use, all-porcelain-crowns and precious metal crowns, such as gold ones. the color of the adjacent teeth. They are the most durable type of crowns. They are perfect for back teeth, because of the intense pressure incurred during chewing. Porcelain-fused-to-metal crowns rarely chip or break and are ideal for grinders. Their aesthetics is second only to all-porcelain crowns. 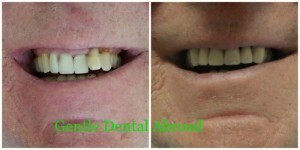 When we use them to restore front teeth, we recommend upgrading the edges with all porcelain shoulders. This way as time goes by and the shape of the gum changes, the metal does not show as a black line between the teeth and the gums. And the smile remains brilliantly white. Advances in dental technology have led to the creation of a new generation of crowns with superior aesthetic appearance. They are loosely referred to as ceramic crowns, the most common of which are all ceramic, Zirconia and Emax. They are either made from ceramic material or from a white translucent core such as zirconium oxide and porcelain. Their defining characteristic is that they look very natural and blend well with the natural teeth. Their translucent core allows the light to pass through, as it does with natural teeth. We usually recommend them for teeth that show when you smile. Partly because they are more costly and partly because they are not strong enough for molars. Zirconium crowns are a notable exemption. They are durable but also stringent and can be used on back teeth. The biggest drawback of all ceramic restorations is their higher cost. 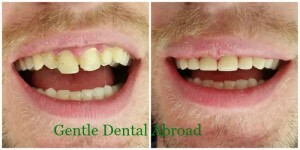 They are usually significantly more expensive than traditional porcelain-fused-to-metal crowns, but luckily this is not the case in our practice. Cost and aesthetics considerations aside, the choice of the dental restoration lies with the dentist and can only be determined after initial consultation. Once we have created a study model and consulted with the dental technician, our dentist will be able to recommend the solution(s) that offers the best combination of shape, color, durability and endurance.